No Fenders -Formula 1, IndyCar and A Whole lot more..: Yo' Pace Car Driver, better Check your Speed! As I only thought it was the Mean Streets; Err parking lot round Reliant Stadium in Houston that had Wicked Yumps! Right 'HULIO? By now you've most likely heard about the Bizarre' accident taking place on Detroit's Belle Isle, when the Celebrity Pace Car Driver, General Motors Executive Mark Reuss inexplicably Spun Out on the Warm-up lap ironically in the Chevrolet Duals in Detroit. Crashing after stepping a Wee Bit too Hard upon the loud pedal; ZOINKS! As I burst out in laughter over this most strange occurrence which caused a 34min delay to the start of the race, which hadn't even gone Green Yet! Although Ruess isn't the only Pace Car Driver to do so to varying degrees 'O difficulty, with the likes of Eldon Palmer, Lonestar JR' and "The Flying Dutchman" to have issues behind the wheel. Whilst I've got ZERO idea if they were using the same "Celebrity" Pace Car used at Mother Speedway? Which reportedly boasts a Gynormous Horsepower rating of 755bhp from its Supercharged 6.2-litre normally aspirated V-8! Although my brain screamed that AIN'T the first time that's happened! Since thanxs to endless racing conversations over the years with Offical' No Fenders Photographer CARPETS', I knew that it had happened once no less than at Mother Speedway in 1971. 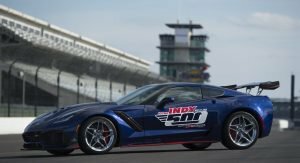 As NO word on whether or not if somebody bought the entire massive Indy 500 Corvette Pace Car collection auctioned off just prior to this year's race in Indiana will wish to add this slightly askew Corvette Pace Car to their collection, Eh?